The Beatles 50 Years Ago Today: April 13, 1969. Beatles Radio: The Beatles, Solos, Covers, Birthdays, News The Fab 4 and More! The Ballad Of John And Yoko was recorded in a single day by just Lennon and Paul McCartney. On this day Lennon arrived at Paul McCartney's London home to work on his unfinished song. After quickly completing the writing, the pair immediately took it to Abbey Road to record. The recent Let It Be sessions had been full of friction - The Beatles steadily unravelling as a unit. The Ballad Of John And Yoko saw Lennon and McCartney collaborating as equals, showing a renewed enthusiasm for recording. Lennon had said "It was very romantic. It's all in the song, The Ballad Of John And Yoko, if you want to know how it happened, it's in there. Gibraltar was like a little sunny dream. I couldn't find a white suit – I had sort if off-white corduroy trousers and a white jacket. 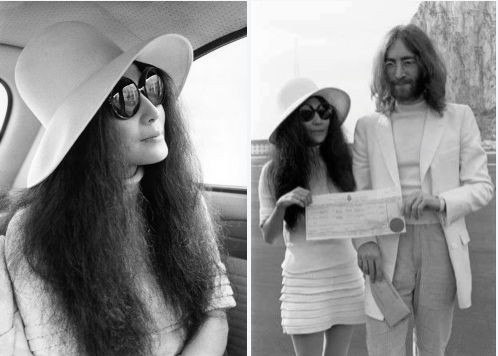 Yoko had all white on." The song was originally written in the days immediately following Lennon and Ono's wedding. Paul said "John was in an impatient mood so I was happy to help. It's quite a good song; it has always surprised me how with just the two of us on it, it ended up sounding like The Beatles."